Most of the resources we need to power our growing economies — oil, gold, copper, coal, and more– come from the ground underneath us. Modern mining operations are increasingly turning AI and machine learning technologies to help keep those resources flowing without risking human lives. 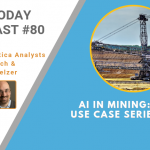 In this podcast Cognilytica analysts explore various ways that AI technologies are being used in the mining industry.